You are currently browsing the tag archive for the ‘Karen Miller’ tag. Media tie-in novels can be problematic as they are often viewed by other members of the writing community as something less than real writing. With an existing fan-base waiting eagerly for anything new, there is a temptation for publishers and authors to be less stringent in standards of writing and adhering to canon. Certainly, some of the media tie-in novels I have read in the past fall into this category. Fortunately, there are many more such novels that are written by talented authors who are fan enough to ensure that not only is the writing good but that the canon survives. Alliances is one of the good ones. 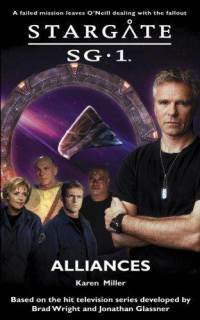 I’m a Stargate SG-1 fan and reading this book has given me a deeper understanding of the individual characters and a new perspective on the Stargate universe. The story is set immediately following the events depicted in the Season Four episode “The Other Side”. In this episode, SG-1 are faced with making some heavy moral decisions regarding obtaining new technology and weaponry to assist Earth in its fight against the Goa’uld, at the cost of supporting a totalitarian regime determined to ethnically cleanse their planet, Euronda. The divisions within the team that develop during the TV episode are carried through into the book and threaten the successful completion of their mission. Although you need to have at least a passing familiarity with the series to fully appreciate this story, don’t worry if you haven’t seen the relevant episode recently, there’s enough back-story provided for even the most forgetful fan. Following after the events of Miller’s much accoladed The Innocent Mage and Innocence Lost books, this is the first book of a new series in the same world. Initially focusing on the original characters, the story gradually segues to concentrate more on the younger generation (hence the Fisherman’s Children of the series title. Almost two decades after the events of the previous books, much change has occurred for the people of Lur. Still greatly affected by the events prior to and during the Mage War, the people struggle to adapt to the new circumstances of their world, and when things begin to become unstable once more, it is difficult to see their way forward. Son of heroes Asher and Dathne, Rafel seeks to forge to the future, but is blocked on all sides: by parents unwilling to see him hurt by magic or conflict; by a sister too fragile for the world; by a mortal enemy, who maybe isn’t quite what he seems. Rafel struggles against all those who bind him, and in doing so, both risks himself and simultaneously may be the shining hope for his people. I enjoyed reading The Prodigal Mage, but it seemed to take a good while to really get into the story. I haven’t read the Kingmaker, Kingbreaker sequence, and found myself feeling a bit left out because of it, as the characters are clearly still quite entrenched in those books. For me, the second half of the book, when it really started to focus on the younger generation, was when I truly became engaged, but at the same time, the first half really made me want to go read The Innocent Mage books! 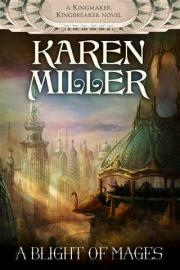 Miller is a multi-talented writer who has a grand vision in her stories, and it’s always a pleasure to read her books. I don’t think I found the characters as three dimensional as is usual for her work, primarily because there seemed to be an expectation that the reader was already acquainted with them from the earlier books. This left me a bit high and dry, but I eventually gained a feel for most of the characters. I think it would be a far better experience to start with the original books, from all accounts, a worthwhile read in themselves, so no real hardship for the lover of good fantasy! 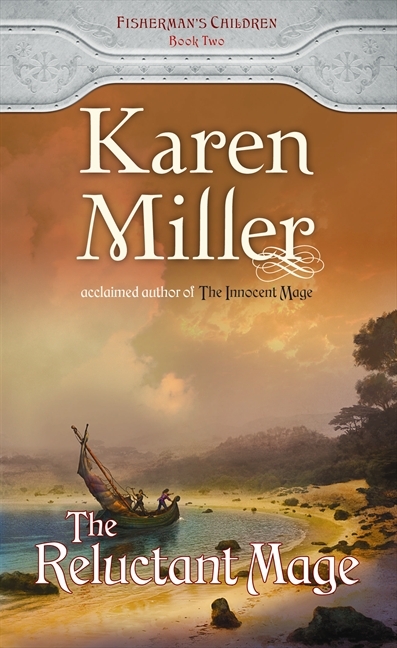 The Kingmaker, Kingbreaker novels (The Innocent Mage and Innocence Lost) were Karen Miller’s debut novels; extremely assured and well written novels. She has since gone on to demonstrate repeatedly that it wasn’t a fluke – she is a highly skilled writer. However, A Blight of Mages is not her best work. The essential problem is that A Blight of Mages is a prequel to the Kingmaker, Kingbreaker duology, and as a result many readers will have a very good sense from page one of what will happen. This robs the narrative of a lot of its momentum, and although the novel is still interesting, it isn’t exactly riveting. A Blight of Mages focuses on Barl Linden and Morgan Danfey and their relationship. Those who’ve read the other novels will know that these two are towering figures of history, and will know in broad terms what happens between them and what impact it has on their society. However, assuming you have picked up a book labelled “a Kingmaker, Kingbreaker novel” without having read any of the others, the plot goes like this: Barl is a powerful mage, but because she is socially inferior she is denied the highest levels of training and has only limited opportunities to use her power. She chafes under these restrictions and believes the powerful Council of Mages is abusing its power by reinforcing the social strata that mean more than magical power or talent. It’s been five months since Rafel left and he’s been given up as lost, but Deenie knows he’s still alive and in trouble. Dreams of Rafel trouble her and after a devastating tremor she decides to go after her brother with Charis. To get to him first they must brave the whirlpools and get beyond the dragon’s teeth. 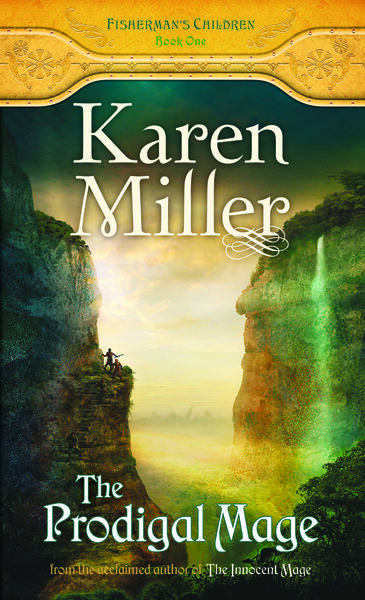 I’m very much a fan of Karen Miller’s work and have been reading her books for years. I found it took me a little while to get used to the style of some of the dialogue, mainly because it reminded me of Yoda. Although these scenes help the world building the dialogue also breaks the pace of the story.